Let Billy Graham, one of the world’s most beloved pastors, daily guide your child in understanding the truth of Scripture and trusting God’s great love. 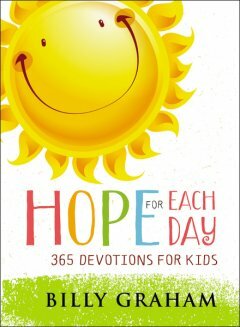 Hope for Each Day: 365 Devotions for Kids presents the same messages of the bestselling devotional for adults in terms children can understand. Each day’s devotion corresponds with the theme and Scripture of the adult devotional, making it easy for families to share devotional time together. Bring Billy Graham’s cherished wisdom and message of hope home for the child you love. This devotional is beautiful! I love the way this devotional is used in several translations including the AMP, ESV, ICB, NASB, NKJV, KJV, NIV, NLT, TLB and The Message. It is great because you get all the version with 30 days of Jesus and 90 days through the Bible. I love the ribbon attached to keep your place, but also that each page is number with the day for the calendar year. This 365 day devotional is perfect for elementary age children and is easy to understand. I love the images. This would be a perfect gift for a child's baptism or profession of faith. I love the idea of reading this to your child at night to engage them into a deeper relationship with Jesus. Don't hesitate on picking this devotional up for your children. You won't regret it. It is beautiful and you'll love the images too! Overall, my only knock against this devotional is small prayers at the end to teach children the significance of prayer, especially if your child is reading the devotional to you. I give this devotional 4.5/5 stars. Thank you to the folks at Thomas Nelson for providing me a complementary copy for review purposes only. I wish that I had little ones. This is wonderful.